What’s there to know about Mount Eerie? Or, better question, what is there to search and find out about Mount Eerie? Mount Eerie is a project led by Phil Elverum, who used to do the band the Microphones. Volume 1 was released under the Microphones name. Elverum is based in Washington state. 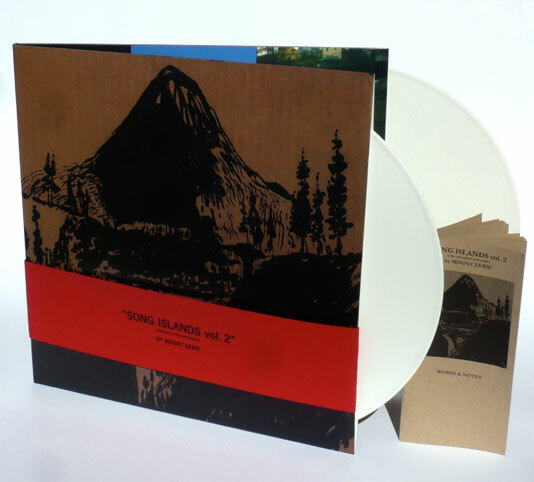 His latest, Song Islands Volume 2 was one of those albums sent to me by a publicist (a great one, Matt Charlton, I might add). I must honestly say I know nothing of Volume 1, the Microphones or what it says in the 30+-page booklet that comes with the physical vinyl albums, so this one kind of came out of nowhere for me. What I’ve heard is basically the entrance into a man’s imagination, into what he sees through music. That’s more or less what music is for everyone (that’s a case to be argued), but never have I felt so close to the texture of the process. Elverum put 31 short tracks of half experimental indie half somewhat shoegaze rock in. We sit, we listen and we learn. It’s an intimate experience. Charlton describes the songs as “scattered, isoloated non-album tracks,” and with the title of the album, that’s great. Song Islands. They can be islands because they’re short, scattered or isolated from conventional music. This album is clearly not one you can listen to at a party or in the car, it’s one you need to attempt with patience and headphones. Elverum uses a slew of noises and instruments, conjuring up all these details that are more deadpan than mysterious swirls. He could sound like a boy fiddling around in a shed; like he’s on the Indian train tracks in The Darjeeling Limited; like he’s between the pages of a picture book; or perhaps quietly swaying in a wheat field, on a small boat in a big body of water or just in his room. Alone or accompanied. The use of guitars and drums are the most noticeable, but it’s Elverum’s voice that is the biggest hit, the dream catcher. Song Islands Vol 2 is romantic, careful and interesting. It’s not something that can catch you easily or on the first try, but it grows, even if you just appreciate the intricacy and history to Mount Eerie. For fans of Seth Smith, Sufjan Stevens. Song Islands Vol. 2 is out October 19 via P.W. Elverum & Sun, ltd. This entry was posted in Uncategorized and tagged Album Review, American music, Downloads, Emerging Artists, Free music, mp3, mp3 download, Music, New Releases, Review, Upcoming Albums by Jessica Lewis. Bookmark the permalink. The mp3 link is missing the “www.” prefix. Without it there’s an error when you try to fetch the file.